Janina had been adamant about not wanting to wild camp before we set out on this trip even throwing a mini-tantrum when I suggested that there might be times when we had no choice. 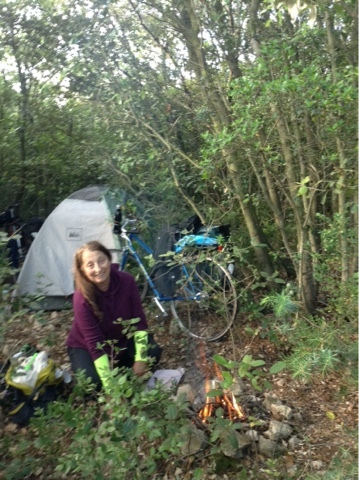 It wasn't that she had never wild camped before, as we had several times on short tours in the US, just that she feared getting caught doing something that might be against the law in a country not her own despite my vast experience having wild camped close to a thousand times all over France. I didn't force the issue, but well knew that the occasion would arise when she would run out of energy well distant from a town or campground and wild camping would be an answer to her prayers. And so it happened on Day Two of these travels. She had started the day with weary legs from her efforts the day before immediately getting off her bike and walking the first hill we came to, something she hadn't had to resort to the day before. And she walked just about every other hill when there was too much traffic for me to ride alongside her with my hand on her back goving her an assist. By six p.m. after thirty-two miles, the same as we had done the day before, she was nearly depleted. When another series of climbs presented themselves with the next town with a campground ten miles away, she conceded that she'd welcome camping in the nearby forest. I volunteered to continue pushing her, but she'd had enough time in the saddle. I might have insisted we needed to continue on if we hadn't had a chance to fill our water bottles just a few miles before at a cemetery, Janina's introduction to that vital water source for the touring cyclist. It would have been iffy otherwise if we had enough water to prepare our couscous and other water needs for the night. We could accept the cemetery as an affirmation that wild camping was our fate for this night. If we hadn't squandered over two hours in Alés waiting for the tourist office to reopen after its lunch break, not realizing it was a holiday, it wouldn't have been so late when Janina felt she had had enough and we might have made it to a campground. Our prolonged lunch break may have been good for our legs, but not so good in reaching the campground before the dinner hour. I didn't mind at all breaking the no wild camping dictum. As happy as she was to have ended the cycling for the day, she wasn't so sure about her decision as we carved out a space for the tent in the thick forest and rocky terrain. After we'd settled into the tent a panic of what might lurk in the woods began to possess her and she was near sobs, nothing to be alarmed about as she considers tears a good thing. I offered to take the tent down and push on, but she didn't want that either. The glamour of bike touring took a day-long hit. Janina was exhausted enough to sleep solid for most of the night, though she said at one point she awoke when she thought she detected a whiff of sulphur, a sign the devil was near. All was well in the morning, especially when she was able to make a campfire and boil up some water for coffee. As much as she enjoys camping, she said she doesn't take the satisfaction I do in roughing it or being independent of the constricts of sanctified camping. She rather likes the amenities of a campground, even if she has to share them with the masses. I have had such a prolonged indulgence with camping where no one has, I have no qualms about taking a break from it in these times with Janina as we did the next night in Orange. 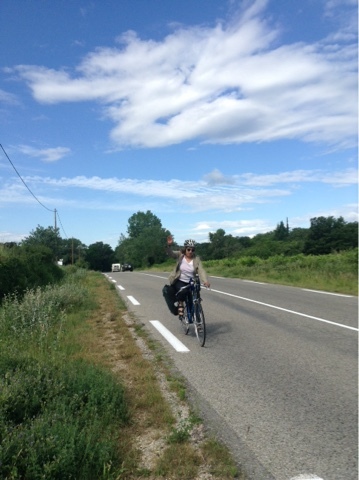 The terrain flattened as we approached the Rhone River, so Janina needed only minimal assist on Day Three. The smile of Day One was back on her face especially handling gentle rises on her own. The only walking she did was on the narrow sidewalk over the Rhone. The road was too narrow for her to be comfortable riding either it or the sidewalk, even though there was a handful of other cyclists demonstrating they could survive the minimal traffic on the bridge. The Rhone is a monumental river, as wide as the Mississippi at this point, so Janina was happy to be able to gaze upon it at pedestrian pace. There was no craft upon it, nor nuclear plants within her vantage, though there are some. We had a late lunch beside an elementary school during its afternoon exercise break. We were entertained by the students prancing and dancing to the music of Strauss. "The French are so civilized," Janina commented. "Can you imagine American grade schoolers exercising to Strauss?" At one point the kids laid on their backs and pumped their legs in the bicyclist's whirl as if to honor us. But for Janina the highlight of the day may have been finding a fuel canister for our stove at the Carrefour supermarket. No worries now about having coffee whenever she pleases. Andrew, the Australian I had cycled with three years ago, bequeathed me the stove. I hadn't used it since, as such canisters can not be found in the US and I'm not a coffee drinker. It's s simple little apparatus one screws onto the canister, but I had to seek the assistance of Craig to figure out how to attach the four prongs that one's pot or skillet rest upon. It took some WD-40 to loosen the burner that one must unscrew first, and then screw back on. The lone campground in Orange was just beyond the city center, less than half a mile from the old Roman Arc de Triomphe, one of the city's two main attractions, along with its 9,000 seat Roman theater dating to the early Christian era. 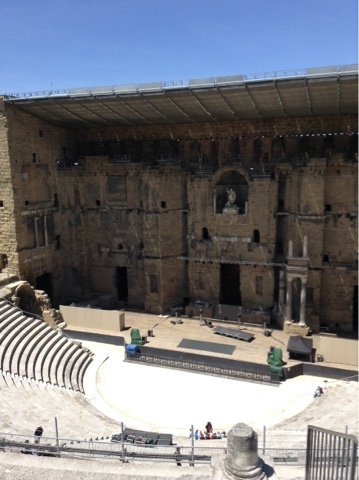 The theater was second to none in the Roman Empire and is just one of three still standing in the world with its back wall in tact--a full ten stories high. The others are in Turkey and Syria. We took a rest day to do it full justice and to do a few errands, including a ride out to the Decathalon sporting goods store to acquire a better sleeping pad for Janina and upgrade her foot gear to a pair of Merrill sandals. When we walked into the huge open air theatre Janina's first reaction was, "This is way cool." She had written at length about our visit to the incomparable Roman ruins of Baalbek in Lebanon a year-and-a-half ago on her website merelycirculating.com and knows such antiquities well. Within the confines of the theater were a series of dungeon-like rooms with screens showing videos of performances in the theater. There were rock concert appearances by Frank Zappa and Elvis Costello and Dire Straits. There were also videos of recreations of the ancient Roman plays that had graced the stage here and also snippets from a number of operas. The extraordinary exhibits also included a series of panels giving a good lesson in Roman history in the region that Janina was happy to translate with her professorial aplomb. Perhaps Janina will grow to love wild camping? It's an acquired taste for most people being so far removed from civilised sleeping arrangements. And it makes that bed so luxurious when you finally get back into it. Just great. Go wild camping. It rules, and for the most part, it is easy to find a spot.